Our employees are to thank today as Scott Dockter is named one of the Highest Rated CEOs on Glassdoor, according to the company’s most recent report. 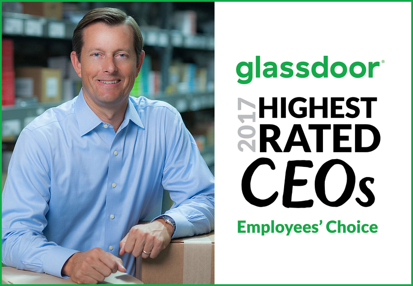 Glassdoor®, one of the world’s largest and fastest growing job sites, released its annual report highlighting the Highest Rated CEOs in several countries throughout North America and Europe. Currently, there are over 700,000 company profiles on Glassdoor and the website receives an average of 41 million visitors to their site each month. The U.S. Small & Medium Companies Highest Rated CEOs list is comprised of the top 25 rated CEOs of companies with less than 1,000 employees. To be considered for the award, companies must have a minimum of 35 CEO reviews during the time period May 2, 2016 - May 1, 2017. "The CEO has a great rapport with the staff and meets with small groups regularly to help promote communication among departments and facilities as well as up and down the ranks. He inspires the staff to be the best we can be every day." "Being able to talk to the CEO with liberty is amazing." "Our CEO is highly motivated which brings a lot of positive energy to our company." "From the CEO down, the organization invests a significant amount of time and effort on strengthening relationships, employee development and cultivating strong partnerships with vendors and clients." "CEO makes a point to know every employee's name." "Our CEO even has periodic breakfast sessions with us (everyone in the company) so that he can get real feedback on how things are going. AMAZING." "Great company with an open door policy for all management including the CEO." CEO approval ratings are gathered through Glassdoor’s online company review survey, which gathers current and former employee sentiment about job and company satisfaction, the work environment and the culture. Employees are asked to rate a number of workplace factors like compensation and benefits as well as work-life balance, and asked whether they approve, disapprove or are neutral about the job their CEO is doing. In addition, employees are asked to describe some of the upsides and downsides of working for the company and provide any advice for senior management. Click here to see the complete list of Highest Rated CEOs in 2017 on the U.S. SMB list here. PBD Worldwide is the leading fulfillment services provider for e-commerce companies, retailers, corporations, publishers, associations and faith-based organizations. PBD provides custom order fulfillment solutions for over 120 B2C and B2B clients that enable growth and streamline operations. PBD employs more than 250 people, operates out of four domestic distribution centers and one international facility equaling 480,000 square feet. To learn more, visit www.pbd.com.